The blog title is Oops. A blog by Chris Little, so you already know my name. 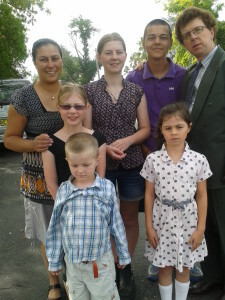 I’m a Christian, husband, father of five, and employed as minister of Albury Bible Church. Here’s the family. They’re a good-looking bunch, aren’t they? The content of the Oops is eclectic, with a few obvious themes. There’s the Bible and theology. There’s how we live as Christians, and do Christian ministry (employed or not). There’s interest in words, and signs. There’s observations about our world and society. And I hope there will be discussion and comment. Feel free to jump in, to comment, and to link to any of my posts you find interesting.